overlooking the creek & sidewalk. Spring has sprung and flowers have opened their sleepy eyes. the catawba tree is leafing. to feel the possibilities at our fingertips. It is without a doubt spring. A mockingbird is on the wall above the creek. White flowers are so exquisite in the moonlight -- they positively glow! Good choice. . .
To all - rain was moving in as I took these images, the darkened morning sky perfect light to make the white pop. Soon to be added - white hydrangeas & bridal wreath & a butterfly maple - all are sitting outside waiting. In the very early evening the sky went all pink and these dogwoods did indeed almost glow. And mrs. m - Me too. The word just made me smile :) And festooned it is! I will have to take a picture tomorrow. I should add as a PS that it is Katie's yard, that I am the renter. But I have been here forever (indeed long before she married my landlord - LOL!) and so I call it our yard, forgetting. I know she pays it no mind, but still, she is only a few months married and lavishing TLC to this old house and yard - it is hers, and she deserves that recognition. I am lucky to have her upstairs, as a neighbor, as a landlady, as a friend. Plus she has fabulous taste!! :) White hydrangeas!!!! fabulous. 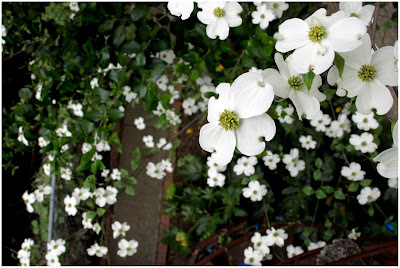 I have never seen a prettier dogwood. it sounds heavenly there.